If you know how to change your mouse’s behavior in Windows Vista, you can make sure that the mouse is set to work specifically with your needs. The mouse settings are great for customizing the computer for a person with limited mobility, but they also can make life easier for anyone who finds themselves yelling at the computer because they can’t find the cursor. Choose Start→Control Panel→Ease of Access and then click the Change How Your Mouse Works link. The Make the Mouse Easier to Use dialog box opens. Select the settings that you want from the following. The Turn on Mouse Keys setting: You can use this setting to use the numeric keypad to move your mouse cursor on your screen. If you turn this feature on, click Set Up Mouse Keys to fine-tune its behavior. The Activate a Window by Hovering Over It with the Mouse check box: This option is pretty self-explanatory; however, you might find it a nuisance after a while if you are sloppy with your mouse movements. 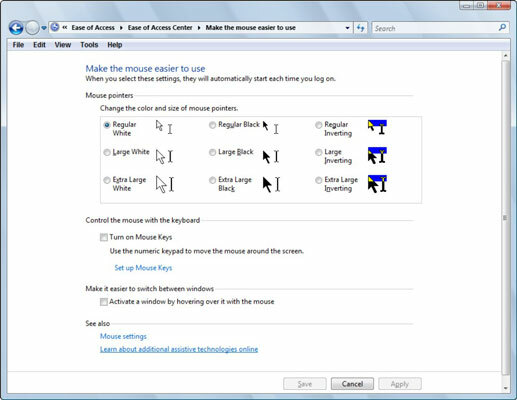 If you want to further modify the behavior of the mouse pointer, click the Mouse Settings link. Select the Pointer Options tab and choose any desired options. The options on this tab allow you to control how the pointer works. You can set the pointer speed (how quickly the pointer moves when you move the mouse), activate the Snap To feature that automatically moves the mouse cursor to the default choice in a dialog box, or modify the little trails that appear when you drag the pointer. If you’re left handed, you can click the Buttons tab and use the Switch Primary and Secondary Buttons feature to make the right mouse button handle all the usual left-button functions and the left button handle the typical right-hand functions. Click OK to close the Mouse Properties dialog box and then click Save to save the new settings. If you have difficulty seeing the cursor on-screen, experiment with the Windows Vista color scheme to see if another setting makes your cursor stand out better against the background.